— In a bowl, sift together flour, baking powder, baking soda and salt. Add anise or lavender seeds. — With an electric mixer, beat sugar and oil. Add eggs one at a time, orange blossom water and honey; mix until smooth. — Using a wooden spoon, incorporate this mixture to the first one. Add orange zest, pine nuts and apricots. Add a little flour if the dough is too sticky. 25 minutes or until golden. 6 minutes on each side or until dry. Cool on wire rack. 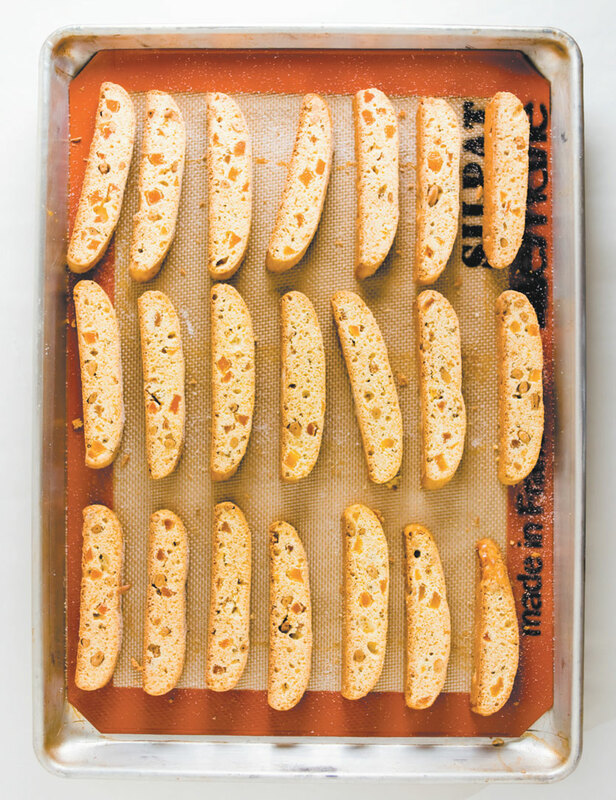 FINALE — Biscotti are perfect with Greek coffee or espresso. For a special treat, crumble them coarsely and combine with small berries, maple sugar and mascarpone. Serve in a champagne glass with fresh mint leaves as garnish.